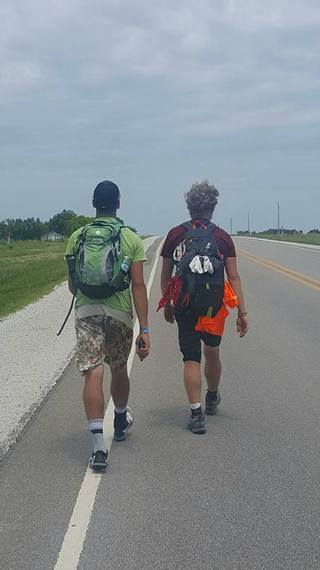 Barry Jurgensen, the history teacher from Arlington High School in Nebraska, set out from Nebraska City on June 1st to begin his 500-plus mile journey to Chicago, Illinois. He's retracing the footsteps of two freedom seeking women who escaped the bonds of slavery in 1858. Barry's goal is to raise awareness about the continued existence of slavery in the U.S. and around the world and to raise money to fund human trafficking prevention education in schools. This blog will follow him all the way. I spoke with Barry today by phone. Robert: Barry, what readers really want to know as you approach Badger Creek State Park, 150 miles into your journey - have you seen any badgers? Barry: Ha! No. But I'm told there's a den of badgers next to where we're staying tonight. Robert: Have you seen other kinds of wild animals? Do you have some way of repelling the ones that may not be as impressed by your walk as we are? Barry: We've seen a lot of deer and a lot of song birds. And, there have been lots of snakes sunning themselves on the highways. We pick them up and put them back in the grass. Robert: Barry, I have a treat for you this morning. I want to introduce you to Dr. Stacey Robertson. 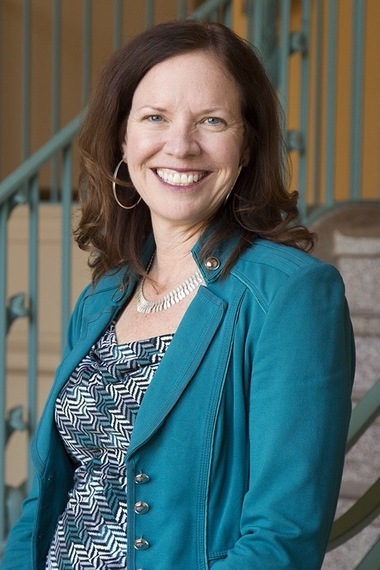 She's the Dean of College of Arts and Humanities at Central Washington University in Washington State. She's also the Co-Director of an organization called, Historians Against Slavery. But I like her because she laughs at my dumb jokes and she's also very funny. Stacey, as an historian of the antebellum time period, you know as much about the challenges faced by people escaping the bonds of slavery as anyone. What might it have been like for these two women traveling the same roads that Barry is traveling now? Stacey: Somewhat different. They would have been traveling at night. They would be very scared. Probably walking without shoes or comfortable clothing. Very little opportunity for rest. Robert: Barry, how much of a sense are you getting of what it was like for 19th century freedom seekers making their way north? Barry: Well, one thing - Celia and Eliza would have met people that gave them food, shelter and water and that's what is happening with us. It wouldn't have been comfortable for them and we're experiencing some of that too. I've been sleeping on floors at night so that's similar. And, when you wake up on the floor, it really makes you appreciate a bed. Stacey: Are you ever fearful for your safety? Barry: Not yet. When I first thought about doing this I was afraid of people saying or doing negative things during the walk, but so far so good. I had to overcome that fear in order to fight modern slavery. Stacey: What was the initial motivation to do the walk? Barry: My students were researching the Underground Railroad. The stories of sacrifices people made got me thinking that I needed to do something for my own kids and all kids. Stacey: I'm sure this has inspired others. All we need is one spark. Robert: Stacey, while people trapped in modern forms of slavery don't typically flee hundreds of miles by foot, does the Underground Railroad symbolize in any way the journey of human trafficking survivors? Stacey: It does. It symbolizes modern slavery in every way. It's not only about escaping exploitation, it's about taking control of your own life; being able to make ur own decisions. The journey of survivors can be physical and it can be mental. Someone like Harriet Jacobs found out quickly there are multiple shades of freedom even after escaping slavery. She endured it every day. The Underground Railroad helped people reclaim who they were or could be. It's also about community building. You are relying on the help of others. We all have to rely on each other. Barry: Comparing victims of modern slavery to historical slavery: after emancipation, the Freedmen's Bureau helped people in the same way as some of the victim service agencies, non-profits and residencies help today's survivors. Stacey: Barry, I have tremendous admiration for what you're doing. This is very important. People like me are cheering for you. Robert: Thank you both for speaking with me today. Keep going Barry!